The key conclusions from its recent earnings and how investors should think about the company as it enters the new year. FedEx and to a greater extent United Parcel Service (NYSE:UPS) have previously had issues dealing with the surge in demand on certain days during the holiday season, but FedEx's commentary suggested it was fully on track this year. "From a service perspective, we are having the best peak ever at FedEx Ground," said COO David Bronczek on the earnings call. "I should add we are having the best peak ever at FedEx Express and FedEx Freight." Of course, this doesn't necessarily mean it will be the most profitable peak season ever, but it does imply FedEx is servicing peak demand in line with its plans. This matters because both companies can be forced to carry increased costs when they can't meet service levels. For example, a comparison of UPS's fourth-quarter adjusted operating profit and purchased transportation costs shows how increases in the latter -- necessary because UPS is using third-party transportation in order to ensure deliveries during peak demand -- shows how it can eat into profit. Data source: United Parcel Service presentations. Millions of U.S. dollars. The good news is, so far this holiday season, FedEx is managing to service peak demand at a high level. Revaluation of FedEx's net deferred liabilities would increase EPS by between $4.40 and $5.50 in 2018 according to CFO Alan Graf. CEO Fred Smith believes that "if the tax bill works as anticipated, there will be a significant growth in GDP" and this would help boost revenue and ultimately capital spending and hiring at FedEx. There are two big challenges facing UPS and FedEx. The first is maintaining margin in the face of burgeoning business-to-consumer (B2C) e-commerce deliveries -- they can be bulky, inefficiently packed, and expensive to deliver to residencies. The second is generating free cash flow growth in light of having to step up capital spending on networks in order to service e-commerce demand, particularly during peak demand. Starting with margin, the good news is FedEx's ground margin expanded for the first time in over a year. Moreover, Smith declared he was confident FedEx could improve ground margin. Data source: FedEx Corporation and United Parcel Service presentations. FedEx quarters are adjusted to the nearest UPS quarter. Measured in basis points where 100 bp equals 1%. Regarding cash flow, CEO of FedEx Ground division Henry Maier claimed the company is "approaching a transition point" whereby the success of previous heavy investment would enable FedEx to start to "dial back network expansion." 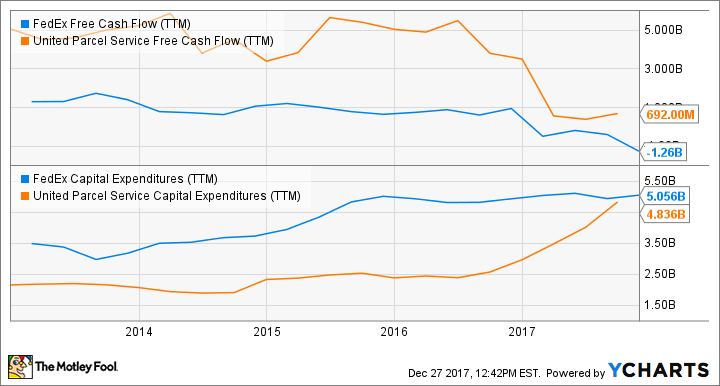 If true, then investors can expect cash flow generation to improve -- UPS and FedEx have seen cash flow generation fall as capital spending has risen in recent years. An earnings call with FedEx or UPS wouldn't be complete with a question on the potential threat from Amazon.com (NASDAQ:AMZN) expanding its shipping business in order to compete directly with UPS and FedEx. Executive VP Rajesh Subramaniam pointed out that Amazon was a longtime FedEx customer and "no single" FedEx customer is responsible for more than 3% of its revenue. In other words, he's pointing out that FedEx is not reliant on Amazon for revenue. However, Smith has previously talked about "fantastical" reports on the matter, which ignore the feasibility of Amazon building out the kind of network run by UPS and FedEx. In addition, investors in Amazon should take a close look at just how much UPS and FedEx have been increasing spending on their networks. Moreover, there is enough e-commerce B2C volume to go around for potential shippers, in fact, the problem is ensuring profitable deliveries and growing margin. Stronger economic growth, favorable tax bills, and a pickup in cargo growth all point to an improving end market for FedEx in 2018. Meanwhile, there are signs of potential margin expansion and increased cash flow generation. FedEx appears to be on top of its peak delivery requirements and the TNT express integration remains on track. The company is set for a good year.